Spread tofu over paper towel-lined baking sheet, let drain for 20 minutes, then gently press dry with paper towels and season with salt. Spread cornstarch in shallow dish. Dredge tofu in cornstarch and transfer to plate. Meanwhile, zest the lime into a small bowl. Add the mayonnaise and Sriracha and stir to combine. In a separate bowl, combine carrots, cucumber (if using), lime juice, and fish sauce and let sit for 15 minutes. Heat oil in 12-inch nonstick (or not) skillet over medium-high heat until just smoking. Add tofu and cook until both sides are crisp and browned, adjusting heat as necessary (I turn it down to medium), about 4 minutes a side. Transfer to paper towel-lined (or not) plate. Spread mayonnaise mixture evenly over cut sides of each roll. 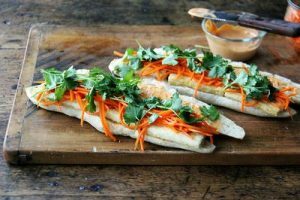 Assemble 4 sandwiches by layering ingredients as follows between prepared rolls: tofu, pickled vegetables (leaving liquid in bowl), and cilantro. Press gently on sandwiches to set. Serve. Place an oven rack in the middle position and preheat the oven to broil. Spray a cooling rack with nonstick cooking spray and place it on top of a baking sheet. Whisk the eggs with the flour, Worcestershire sauce, hot sauce, chili powder, garlic powder and a pinch each of salt and pepper in a medium bowl. In a large bowl, combine the breadcrumbs and Parmesan. Drain the dill pickles and pat dry with paper towels. Working in batches, toss the pickles in the egg mixture so they are fully coated. Remove the pickles, letting the excess egg drip off, and transfer to the breadcrumb mixture. Toss to fully coat. Spread the pickles out on the prepared cooling rack in a single layer (with none overlapping). Place the baking sheet on the middle rack in the oven and broil until the tops of the pickles are a crisp golden brown, about 4 minutes. 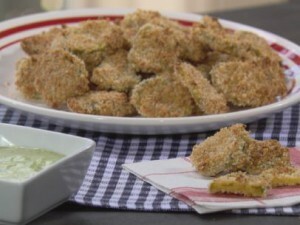 Flip the pickles and continue to cook until crisp golden brown all over, about 4 minutes. 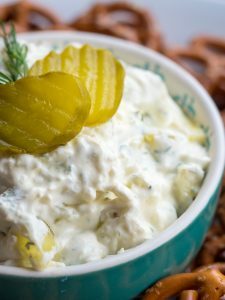 Serve warm with the Diamond Sevens Ranch dressing. In a medium bowl, whisk together vinegar, soy, sugar, sesame oil and chili paste. 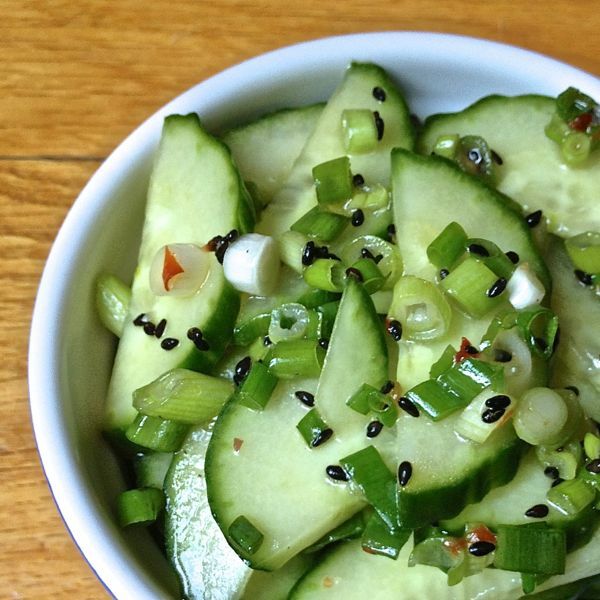 Add cucumbers and scallions to bowl and toss well. Let sit at room temperature for 15 minutes or longer before serving. Garnish with black roasted sesame seeds. In a saucepot, combine the vinegar, sugar, salt, mustard seeds, coriander seeds, celery seeds, peppercorns, garlic, chile and 2 cups water and bring the mixture to a boil to dissolve the sugar and salt. Using a mandolin (or sharp knife), slice the cucumbers 1/4-inch thick and place in a large heat-safe bowl or container. Once the mixture boils, pour the liquid over the sliced cucumbers, making sure the cucumbers are submerged. Let the cucumbers sit in the liquid as it comes to room temperature, for about 20 minutes. Drain the pickles and reserve the liquid. Serve as is or fry em’ up! To serve, add a little of the pickling juice right on top of the pickles. 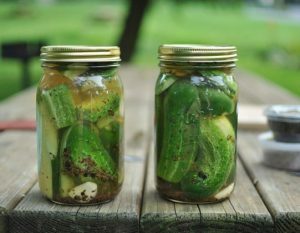 Cook’s Notes: Reserve your pickling liquid to use on the pickles later or as a vinegary addition to sauces. The longer the pickles sit in the liquid the softer they become, so for me 20 minutes is perfect. This pickling liquid is great to pickle a variety of vegetables, try carrots, one of my favorites. 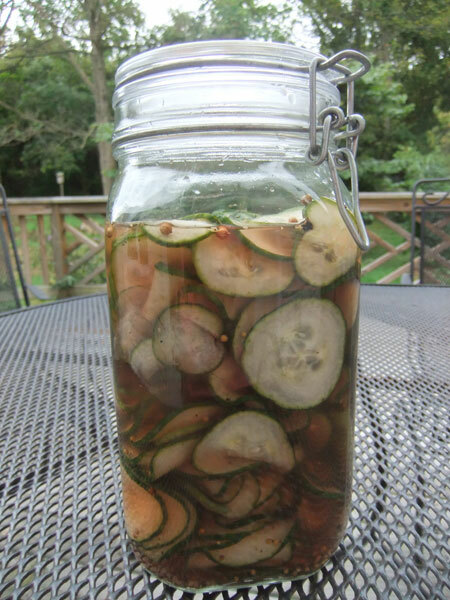 DMV notes:used 1/2 jalaopeno, 2 kirby cukes and reduced the pickling liquid to 3/4. Very Tasty!! In a large saucepan bring 2 cups water, vinegar, sugar, salt, chili paste, and coriander seeds to a boil over medium-high heat. Place cucumbers and radishes in a medium heatproof container; pour hot liquid over cucumbers and radishes; weigh down with a plate to submerge. Cover and transfer to refrigerator until chilled, at least 24 hours and up to 3 days. Drain and toss with cilantro leaves. Drizzle with olive oil before serving. I used regular cukes because kirbys were not in the market. Added many more radishes.